The latest offering to come from the well-known 888 group, Lucy Bingo is a newcomer in the world of online bingo and it’s clear from the off that this site will most likely follow the same trend as the other 888 sister sites. 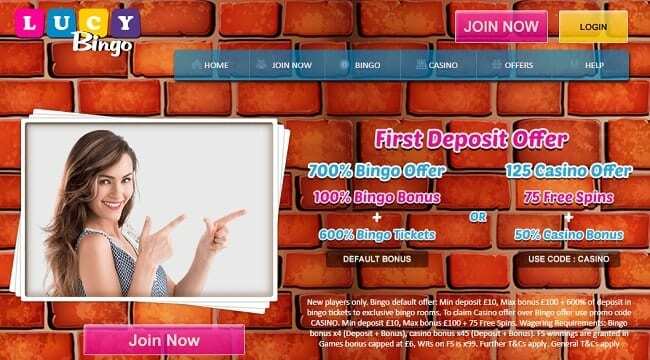 700% BINGO SIGN UP BONUSNew Customer Offer. T&Cs Apply. 18+. Please Gamble Responsibly. Lucy Bingo is a really nice site which is easy to use and offers plenty in the way of games. In this review, we’ll give you the lowdown on what it has to offer in terms of welcome offers, ongoing promotions and games and content. You can also see more of the best bingo sites we have reviewed and get your hands on some of the latest offers. It’s safe to say that at first glance with our Lucy Bingo review, the website appears to have been a little rushed and is somewhat subpar in terms of aesthetics. The brick wall theme on the main banner appears to have no relevance to the site and the rest of the homepage is set against an underwhelming blue backdrop. There is however, a lady who we can only assume is ‘Lucy’, pointing out the latest offers and promotions at the top of the page, and there are multiple ‘Join Now’ tabs scattered across the page, ensuring you know just where to go to get your hands on a login. Visit our 888 Bingo review here to see another site from the same brand as this one. All in all, the site doesn’t score too highly in terms of the way it looks, but we’re sure it can regain those lost points in other areas, starting with that all-important Lucy Bingo promo code. As we mentioned earlier, it is likely that this site will follow many of the same trends as its 888 sister sites and this is certainly the case with the main welcome offer. As is the case with Good Day Bingo, new customers who sign up and login with Lucy Bingo promo code will receive a welcome bonus. The welcome bonus is huge and is great for new players. So make sure you don’t miss out and sign up as soon as you can. So, that’s new customers sorted, but what do they offer their existing customers? Well, This site currently offers a rewarding loyalty bonus that sees its users collect ‘jewels’ that can be exchanged for cash back bonuses. But that’s not all, this is a site that just keeps on giving. There are free bingo rooms every single day, as well as sure win rooms, cashback deals and opportunities to get your hands on free spins. Users can also get a free £2 bingo bonus, simply by liking their page on Facebook, another great little perk. As we mentioned previously, no deposit welcome offers can be quite rare in the online gaming industry, so when one comes around we feel you should make the most of it. So why wait? Follow the simple instructions on the website and sign up to receive your Lucy Bingo login today. Be under no illusions, although the site name features the word bingo, this is far more than just an online bingo website. Other content on this site includes slots, jackpot slots, casino games, table games and even scratch cards, but we’ll have more on that shortly. As far as the bingo goes, players can choose from a variety of different rooms with different stakes, different prizes and even a different amount of balls. The old-fashioned amongst us will probably stick to 90 ball games, however there are 75 ball games available. In terms of stakes, the cost of cards ranges from completely free, up to £1 but you are limited on the number of cards you play in any one game. Slots are becoming increasingly popular for players who are looking for those elusive big wins, and we’re sure you won’t be disappointed with the selection on offer on this site. If you head over to the dedicated slots page, you’ll find over 100 games to choose from, including favourites such as Starburst slots, Cleopatra slots, Asteroids and Gods of Gold. But that’s not all, you can also choose from a number of jackpot games including Millionaire Genie and Irish Riches, where jackpots often exceed the £2 million mark. As mentioned previously, you will also find a number of casino features among the Lucy Bingo games, for those who want a change from bingo or slots. You’ll find all the usual suspects on this site, including multiple varieties of roulette, as well as blackjack and baccarat. The one thing you find at this website is live casino games, which would have put the icing on the cake for us, however, we still feel the content on this site is more than enough to keep players interested and engaged. Now for the bit that often gets overlooked by many, but is actually a vital part of any online gaming site. The software provider that is chosen by a site will go a long way in determining the content that is available and what new slots and games the site will be able to acquire. Once you get your Lucy Bingo login you’ll be able to sign in, use a promo code and start using the games run on the particular software. We’re happy to say that this website has gone with the same provider as many of its 888 sister sites, Dragonfish. Since they were formed in the mid-2000’s, Dragonfish has cemented their place amongst the elite software providers such as Net Entertainment. It powers several well-known brands including City Bingo, Dino Bingo and Frozen Bingo so be sure to check out our reviews of these other sites too. The fact that they have chosen to work with Dragonfish is a big positive for our review, as you know straight away you’ll be getting both top quality content and a website that performs well in all areas. As it was only launched in May 2017, it is no surprise that there isn’t currently a Lucy Bingo mobile app available to download, but you can still play all your favourite bingo, slots, table and casino games whilst on the go. As long as you have a compatible device, be it a smartphone or tablet, you can enter the URL into your chosen internet explorer in order to gain access to the mobile version of the site. You can even use the same Lucy Bingo promo code offers and other promotions that are available. With regards to aesthetics, the mobile site is almost identical to the desktop version and it runs just as smoothly too. From the homepage, you can easily navigate the site and be on the page you require with a just a couple of swipes and clicks. You can even sign up via the mobile site too, so there really is no excuse not to grab your login sooner rather than later. As with other 888 sister sites, the minimum deposit is £10 and the minimum withdrawal is £20. However, you’ll have to deposit at least £30 before you can make your first withdrawal request, which seems a little strange to us, but it certainly isn’t enough to deter us, and it shouldn’t deter you either as this is still a top quality site with lots of positives. So let’s tie up all those loose ends and give you a brief summary. OK, so the site itself isn’t the most groundbreaking, but when it comes to content, this site definitely doesn’t fall short. It offers decent variety in all areas and certainly has plenty to keep you occupied. This brand also does a lot to keep their existing customers happy, with plenty of free bingo rooms and a great loyalty scheme. It could be said that this is just the latest 888 website off the production line, but is that a bad thing? We don’t think so. From completing our Lucy Bingo review, we feel the site does exactly what it says on the tin. It is a no thrill site that places a lot of focus on its content, and for this, we give it a great big thumbs-up and a well-deserved recommendation.